What is an automatic Dispensing solution? A Dispensing Robot is a fully automated system that performs a designated task, set by a custom program, with the utmost precision and repeatability. Each program may have its own dispensing profile. Base robots feature a 3-Axis high precision motion gantry, with accurate, adjustable dispensing controls. Various types of dispensing needles, syringes, dispensing valves, and control systems are available. Return on Investment - PROMATION offers the best value in Robotic Dispensing Solutions and customers often see a ONE YEAR Return on Investment! 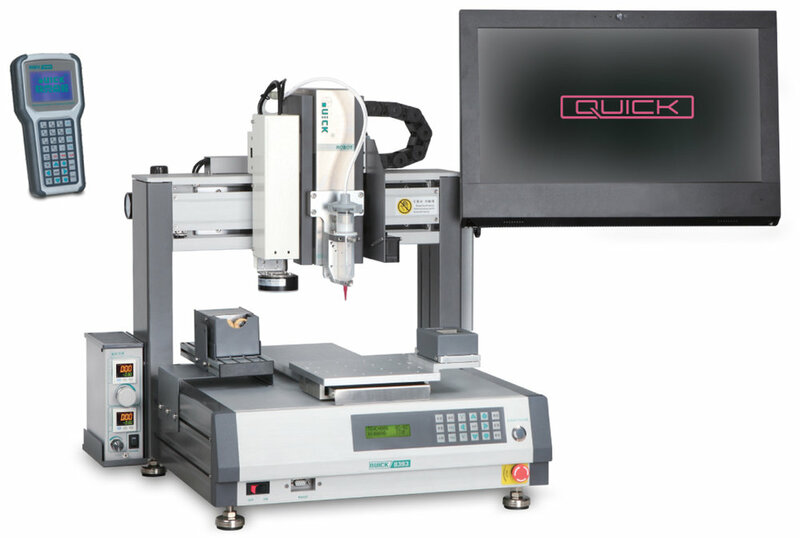 Low Cost of Ownership - These machines are some of the most competitively priced systems on the market. As the base systems are priced competitively, so are the consumable items such as syringes and needles. Versatility - Virtually no job is too large, or too small. From our "small footprint" 100mm x 100mm Working Area QUICK 8333 to our large 400mm x 400mm Working Area QUICK 8433 we can find the right system to fit your specific needs. Besides our three base systems, QUICK 8433, 8333, and 8320A, we also offer a multitude of different Dispensing Controllers, Pressure Tanks, Dispensing Barrels, and Needles / Syringes of various sizes and shapes to fit your specific needs.